In bird hierarchy, screech owls trump wrens. At least that's my conclusion after watching the nest-building activities of both species. A pair of Carolina wrens — cheery, chatty little biddies with an upbeat attitude and a do-what-it-takes work ethic — constructed a leafy home inside an old mailbox we mounted a few years back under the front porch eaves. Working industriously for an entire day, both male and female wren converted the metal letter receptacle into a soft-sided cavern of plant fibers, grass and leaf litter. Unfortunately, their ambitious efforts were in vain. Shortly after the nest was completed, an Eastern screech owl swooped in and commandeered the space, sweeping away most of the wrens' work in the process. I had a feeling that would happen. 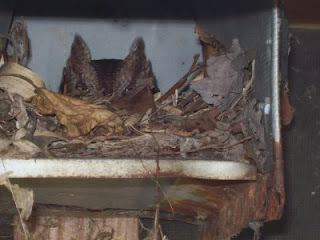 Screech owls are repeat nesters. When a nesting site proves successful, the couple — screech owls tend toward monogamy — return to it annually. For the past two years, a pair of these diminutive owls with tufted ears have claimed that mailbox for their own brood-raising activities. Although small for owls, screech owls are much larger than the tiny wrens. Displacing them probably wasn't an issue. As disappointed as I was to see the wrens' work destroyed, I was pleased to have the owls back. Their presence has become a reliable indicator of spring's arrival. When the weather warms, I find myself listening in the evening for the owl's plaintive wail, a series of quavering whistles descending in pitch. "WhheeeeEEeeeeeee ..." the screech owl sings to the darkening night. "WhheeeeEEeeeeeee ..."
Vocalization is the Eastern screech owl's calling card. If you are outside at dusk and hear what sounds like a small, weak pony whinnying mournfully, you're probably standing quite close to an adult screech owl. Although the cry is a haunting sound that conjures images of creaky stairways and cobweb-cloaked halls, it is actually a means to mark territory or attract a mate. In the case of the birds living in our converted mailbox, the twilight whinnying probably tells others, "This area is taken. Stay away." The wrens got the message and went off in search of a new nest site. What's odd is that the same thing happened a year ago. Last spring, Carolina wrens — also lifetime-maters that return annually to previous nesting sites — built an elaborate structure in the same mailbox as they did this year, only to have the entire nest — eggs and all — flushed out when the screech owls appeared. How could birds smart enough to return to the same nesting spot annually neglect to remember that large predator birds had previously commandeered their space? Nature is full of mystery and contradiction. I suppose innate abilities go only so far. Watching the nest-building developments of the two species has been interesting and thought-provoking. Despite their similarities — mating for life, returning to previous nesting sites, a fancy for old metal mailboxes — wrens and screech owls have decidedly different ideas of how a nest should look. The little songbirds like a tightly woven, tidy nest that will provide their offspring with a safe, soft and cozy spot to develop, while screech owls couldn't care less about such amenities. Their idea of home is a hollow hole, period. End of discussion. After sweeping out most of the wrens' nest — the lazy birds didn't even bother to get rid of it all — the owls proceeded to lay eggs directly on the floor of the metal mailbox. Because they are hunters, maybe they don't feel a need to create a protective space. Perhaps they figure their talons, keen hearing and sharp eyes will provide the protection necessary to raise their young. Whatever their reasoning, I'm looking forward to watching the development of a brood. It takes 28 days for screech owl eggs to hatch and another 32 days before the owlets fly off on their own. That means I have about two months ahead of exciting bird watching. Last year, I never managed to see the hatchlings. Maybe this year I will. thanks, sue. we love it here. i'm so glad to have you following my blog.